I’ve always found graphology interesting although I’ve never learnt about the intricacies of the writing. 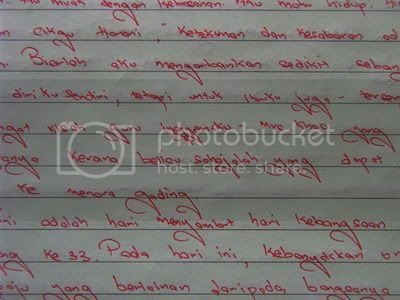 I do remember about the alignment of the handwriting tells abit of the person’s personality. How accurate that would be is subjective though. For example, if the person’s handwriting goes up instead of on the line, the person is supposed to be a dreamer, if the handwriting is on the line, the person is supposed to be a stable, solid person. 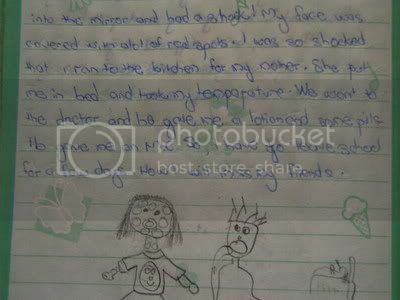 But I’ve always enjoyed writing alot since I was a young girl. I didnt know what prompted me or inspired me – perhaps it was upbringing,once a week my mother would bring me to the library since I was 6 or so, and I enjoyed being lost in the world of imagination from a book and wanted to share my thoughts the best way that I could think of. Through writing. 10 December 1995. I was about 17 then. And just ended my O levels. I was working on the weekends as a waitress then and chanced about one of my numerous crushes while I was working. He was walking with another girl, and thats when I decided that I didnt like him anymore. *laughs* I dont know whatever happened to Yusri, I dont think I could even recognize him if we were in the same room. Its funny reading back that page as the way that I think then and now is so different. I think I’m more open minded as compared to before. 7 August 1998. Take note of the handwriting and the curve of the letters g and y. It was said that when someone has a hook like that, they are very frustrated. I didnt feel frustration then, but I remember that I was extremely stressed out back in Jurong Institute. Pressurised by the extremely tough subjects which I shouldnt have taken having been in arts stream all my secondary life to be facing with the science stream abruptly. I didnt do well in Jurong Institute, however, I never regretted it though, since there were many beautiful memories there which I could never trade for anything in this world. 15 Jan 2005. Well, I dont really keep a diary anymore, but this is just a brief idea of what my handwriting looks like now. I tend to write in all capital letters because it looked neater to me. No more hooks, like what I used to have and my lines are thicker.